This guest post was contributed Scott Fedonchik, Vice President of Marketing at Business Wire. At Business Wire, we are in the business of helping our partners distribute their news to the audiences that matter most to them. We do this through our patented content distribution platform, the NX Network, that reaches media outlets across the world, and through leading mobile and social channels, including over 84 Twitter feeds, Facebook, YouTube, Apple News and LinkedIn. One piece of advice I would give to our customers, or anyone with information to share, is the need to layer in their own LinkedIn amplification plans to their communications roadmap. Over the past year we have been using LinkedIn to help promote our own brand initiatives and news releases. It all starts with a news release, a fully ownable content moment, and then expands outward to other channels that help move the message across screens and platforms that will engage with our target audiences. We have been seeing great results through LinkedIn and wanted to share some insights on what has worked best. 1) Company Advocacy: When you have news to share, be sure to develop consistent and simple messaging for your internal teams. Give them the language, news release content and images, links, tags and CTAs that you want out there and let them work their networks with the messaging. It’s a sure-fire way to break through the noise and help deliver an organic message to potential buyers and influencers. Don’t be spammy and don’t over use this tactic. This is where you, as a marketer, need to consider your message impact and audiences, and be sure you are sharing valuable, actionable content that readers need to know. We have an active group of over 100 staffers around the globe who regularly share Business Wire content and have seen our monthly LinkedIn Pageviews grow by 52 percent over the past 12 months based on this advocacy. 2) Publish a Post: If you are a leader in your organization, or have a unique perspective to share on your company news, develop a short post that offers context around your news release and gives a candid look behind the scenes. Include news release copy (like an executive quote) and links so viewers can find out more information if they are interested. The beauty here is that you can then track engagement with your post, likes, shares and comments from industry peers. Again, this is not something to overuse/abuse and should be done for larger news releases that have broad appeal. Our posts have lead to a 35% increase in organic Followers to the Business Wire company page over the past year. That is hundreds of thousands of additional impressions for our releases, updates and product messages from consumers who have chosen to engage with information from Business Wire. 3) LinkedIn Sponsored Content: To really put some gas on the fire (and have true lead-gen benefits) turn your news release into LinkedIn Sponsored Content. They are designed to directly reach your target audience and offer great engagement tools (likes, shares, comments). They are also a great way to gain brand followers for your company for future marketing efforts. The analytics that come with Sponsored Content also give you a great opportunity to test headlines, offers and creative assets (like video, images, infographics, and memes) to see real-time marketing results. By staying on top of relevant developments in the communication category and through smart industry targeting, we are seeing engagement rates and click-through rates that best industry averages by over 80 percent. Many have converted to news customers. 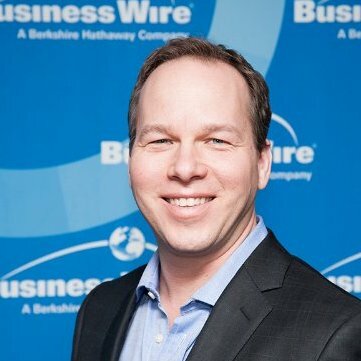 LinkedIn has become an increasingly valuable source of news release readers on BusinessWire.com. In fact, it has become the leading social referral source to Business Wire news content among all social platform. For communications, PR or marketing pros, the toolbox that LinkedIn offers (both free and paid) provides a valuable channel to take the news releases you have developed and amplify them in a b2b venue where this type of communication is expected and appreciated. Whether you’re marketing industrial supplies, IT solutions, media products, your ideas or yourself, LinkedIn has established itself as an essential platform to communicate your offer. As is frequently said, “the only good content is viewed content.” Incorporating steps one through three to your communication plans will help you drive exposure and bring added value for your news releases. For more insights onto get the most out of social media and other digital marketing channels, subscribe to the LinkedIn Marketing Solutions blog.